As the ice and snow melt and spring slowly shows its face, so do the creatures that have spent the last months in brumation, hiding out of the elements. This past spring, my wife caught her first channel catfish, a 32 inch pre-spawn female on a small river. An hour later she hooked on to something a lot bigger. Whatever it was, bit the bait and bit down hard. It hugged on to the river bed and barely budged, the only reason we knew it wasn't a snag was because it fought back. It didn't go on line spooling runs, but there were definite thrashing movements at times with the fishing rod bent and bobbing. Her arms were already tired from the cat fight, and she knew that what ever was on the end of the line was not coming in easy, so reluctantly I took over reeling in. After quite a fight we could finally see a large shell breach the surface, a little more fight and the turtle showed its face. We were shocked, its head was the size of a soft ball, hissing and snapping it had claws like eagles talons, there was no way we were getting it on shore or getting the hook out. No matter how hard I tried, it just kept getting within a meter of shore and charging back down below, we had no choice but to cut the line after a long battle. That night once home, I read through our copy of "The Amphibians and Reptiles of Manitoba" by William Preston. I learned a bit about snapping turtles along with some history and then went online to find more information. I came across http://www.naturenorth.com/Herps/Manitoba_Herps_Atlas.html# , a great website with basic info to help you learn the differences and subtleties of amphibians and reptiles in Manitoba. It includes an interactive database, where submissions of sightings can be compiled by anyone (they are reviewed by a biologist), using a data entry form or spreadsheet depending on level of involvement or number of sightings. The information is then compiled and presented in Google fusion tables. Keeping track of reptiles and amphibians isn't high on the list of priorities in the province and this database is a great step in the right direction. A lot of amphibians and reptiles can be key indicator species and crucial parts of different animals' diets. We all know things change over time, wildlife populations fluctuate, the known range of an animal may change or expand, new species may even enter the province. This is a great way for anyone interested in reptiles and amphibians or the outdoors to help build the body of data on these creatures. Repeated sightings in the same area are okay as well, especially first of the season and last of the season. More than anything they need more reports from the northern regions of our province, so residents or vacationers please keep that in mind. I began logging my sightings no matter where I was, out fishing, hiking, working. Whenever a frog hopped across my path or a snake slithered by, I would do my best to catch it or at least photograph it. I would make note of weather, date and time, where it was, how many and move on. It became a fun addition to being outdoors and took minimal effort. When kids would be bored or restless out fishing I would take them for walks looking for frogs and snakes, or searching the logs and boulders for turtles basking in the sun. It was quite enjoyable sharing what I had learned, although there is still plenty more to learn as has been pointed out before. Throughout the summer, we came across a few snapping turtles on the end of our line, some even biting through the hooks. Always a fun fight but not a targeted species. We saw western painted turtles basking on rocks on multiple occasions, toads near the shoreline in the morning warmth, snakes in all kinds of places and frogs almost everywhere we went. At one of our usual fishing spots where we have been known to dangle our feet in the water on hot days, one of our friends was doing so and no longer than a minute after taking his feet out, a very large snapping turtle came up for air right where his feet were. We don't dangle our feet in the water much any more as I know of two people that have lost a digit or two to large snapping turtles. We have even lost two fish we were keeping for supper on a stringer to a snapping turtle. -It is Manitoba's largest reptile. -The largest common snapping turtle on record is 35 kg. -They are omnivores, eating most anything they can snap on, even small birds and mammals. -The average lifespan in the wild is 30 years, some will make it past 50. -Mating occurs around 18 or 19 years of age. -They are most threatened in the juvenile stage. -Once mature there are very few, if any, predators. A great spring time activity for folks of all ages and abilities is a trip to the Narcisse Snake Pits, roughly an hour north of Winnipeg in the Interlake region. 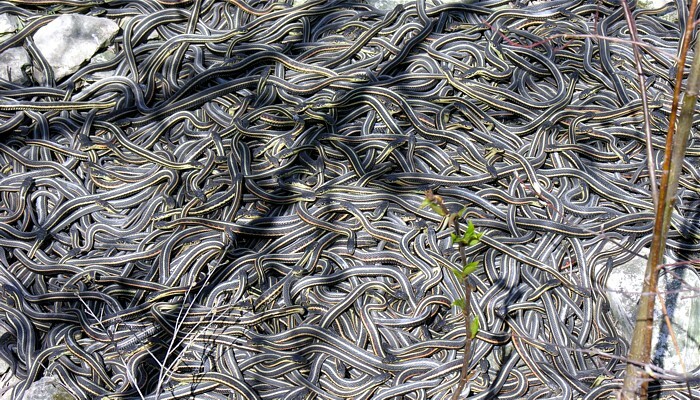 It is the winter home to tens of thousands of red-sided garter snakes. 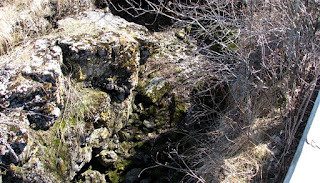 A very accessible area with crushed gravel paths that take you right to some limestone bedrock dens (the closest being 300 meters from parking) where in late April to mid-May the snakes emerge and mate, forming large balls. When mating completes the snakes disperse ,heading for marshes, ditches and many other spots to hunt and give birth. Sunny and warm days are best, with ideal viewing times being late morning to afternoon. There is no fee for entrance to the park and interpreters are on site until the end of May long weekend. Make sure to bring water, hats and sunscreen as shade is minimal and the water on site is only suitable for washing There can be great birding and spring flowers to see as well. You can handle snakes that you may come across as long as you are gentle with them, keeping in mind a snake may bite if you try to pick it up. Don't get mad. They are just defending themselves, are not poisonous and have very tiny teeth that rarely break skin. If you pick up a snake there is a really good chance it may poop on you, another method of defense. The smell can hang around for quite some time, so keep that in mind before you or your kids pick up any snakes. -Females are typically larger than males of all year classes. -This species can grow to over one meter in length. -The chances of a snake reaching 12 years of age are less than 1 in 5,000. -The females likely breed every other year after at least 3 years of age. 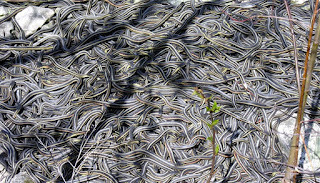 -Narcisse WMA has the largest concentration of snakes in the world! -The four principal threats to snakes are chemical pollution, commercial trade, destruction of habitat by humans and periodic natural catastrophes. There's always a slim chance when fishing that you're going to pull out a surprise. Ours lead to a wealth of knowledge and a fun pass time. Wherever we are in the province, when we spot a reptile or amphibian we take note and are glad we can contribute to people powered science and research.